Features an on-board mounted tank with seed metering, section overlap control, and unmatched maneuverability. Available in 25, 30, and 40 ft toolbar widths. Case IH precision Disk 500T Air Drill lets you be more versatile with a mounted seed tank. Maneuver around buildings and shops without worry​​. No rear hitch is available for the Precision Disk 500T. No rear hitch should be installed, frame damage could occur​​. The Roto-molded tank and tank lid are made of a durable polyethylene plastic for high strength and long life. The tank opening is 2 ft x 4 ft, making it easy to fill tank without pushing material around by hand. The operator can easily access the rear of the tank via a ladder and rear platform. Access to the tank with a bulk seed caddy auger is simple, an opening in the rear railing is provided to allow the auger to fit through and access the tank opening. A tank clean-out chute is found on each rear side of the tank. 100 bu Tank has four clean-out locations. These chutes allow nearly 100% clean-out of the tank. The front and rear slope angle is over 35 degrees while the slides of the tank are over 50 degrees. The side directs the product directly down into the meter and will completely empty out. The integrated tank provides up to 70 bu or 100 bu (depending on configuration) of on-board storage for a single product. The opening between the tank and meter assuring product continues to flow in to the meter to provide precise seed rates and maximum uptime. No additional lubrication of the product should be required. Remove the current door/meter assembly and install the new roller/door assembly. The assemblies are removed by simply unscrewing two bolts on each side of the meter. Seed must be drained from the tank prior to removing the meter assembly. Seed with confidence and success with this ultimately designed machine. 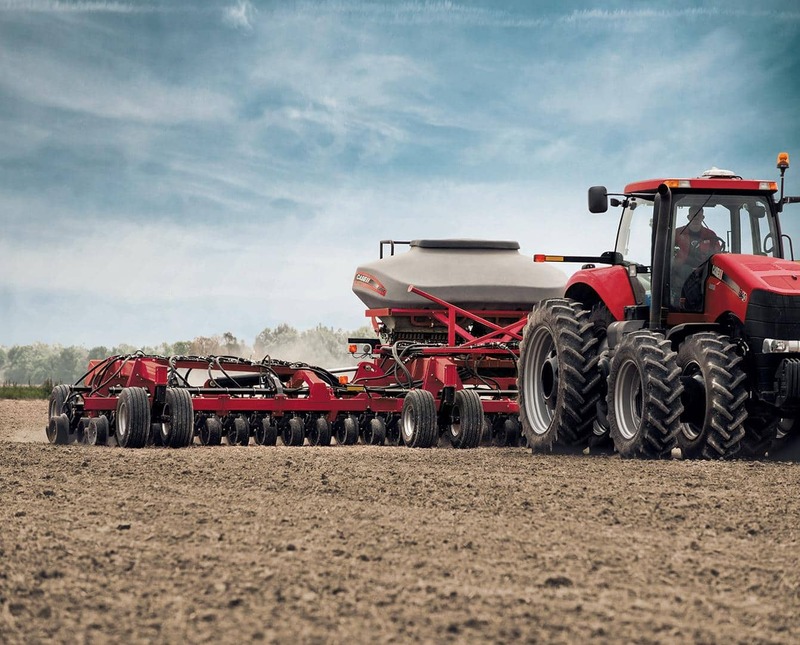 Case IH designed this machine to handle the needs of producers who want to be accurate, efficient, and profitable. These features combine to create seeding technology that yields success. Reduce input costs and increase yields by eliminating overlap on turn rows and odd-shaped fields with a touch of a button or automatically with GPS. Two-section shutoff is standard, and a four-section control is optional. ​Configure and price your new Precison Disk Air Drills. Customize it the way you want. ​Compare our planter specs to other manufacturers' specs.